The Caring Commuter Program helps to encourage people who drive to work daily, to try and use an alternative mode of transportation to get to work, ultimately helping to reduce traffic congestion and your carbon footprint. The benefit in participating in the program is the discounts to local stores that participants are exclusively eligible to receive for their support. 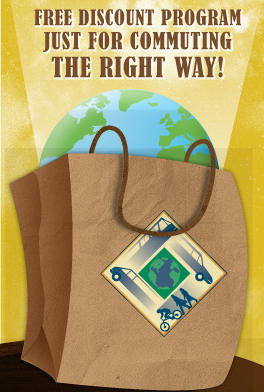 Participating in the Caring Commuter Program is simple! If you Carpool, Vanpool, use Public Transit, Walk or Bike to work at least once a week then you are eligible to apply for the program. By utilizing these alternative transit modes you are helping to reduce traffic congestion, air pollution, gas consumption, and more. By signing up for the Caring Commuter Program you are helping to reduce all these problems that not only affect Southern New Jersey, but the country as a whole. Support this initiative by signing up for the Caring Commuter Program today by completing the form below. Once you have signed up to be a part of the Caring Commuter program, you will receive a Caring Commuter discount card. This card entitles you to exclusive discounts from participating merchants throughout Southern New Jersey. By joining the program you can receive discounts at local, participating merchants including: many restaurants, automotive services, salons, dry cleaners, and more! Becoming a Caring Commuter is easy, and it’s absolutely free! Check back on our website for new merchants who are added frequently. Discounts: Your Caring Commuter discount card entitles you to discounts at local participating merchants. We add new merchants regularly, so check back for additional merchants and offers. 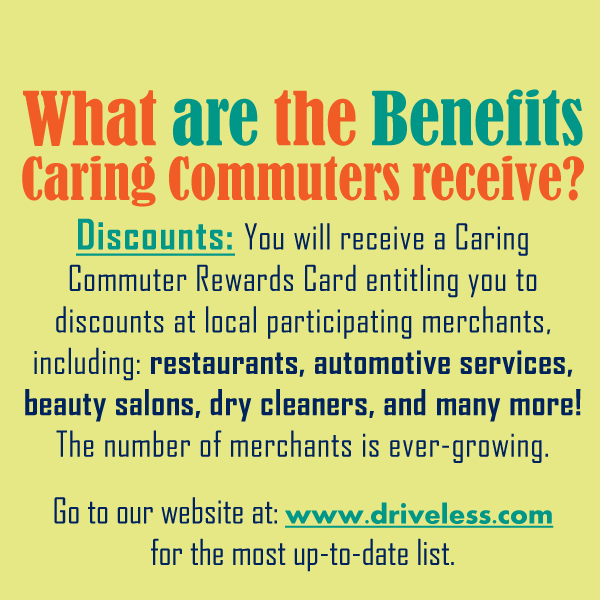 Discounts: You will receive a Caring Commuter Rewards Card entitling you to discounts at local participating merchants, including: restaurants, automotive services, beauty salons, dry cleaners, and many more! The number of merchants is ever-growing. An asterisk ( * ) denotes a required field. Your application cannot be processed if required fields are not completed. You must live or work work in either Atlantic, Burlington, Camden, Cape May, Cumberland, Gloucester, or Salem county in New Jersey in order to apply. How did you hear about www.driveless.com? helmet with the purchase of a bike; 35% off any clothing purchase. DISCOUNT: Bowl 2 games and get 3rd free. DISCOUNT: 20% off dining room check (tax & holidays excluded). DISCOUNT: 10% off regular priced menu items. DISCOUNT: 10% off total purchase. offer. Void where prohibited by law. DISCOUNT: $1 off a Blizzard. DISCOUNT: 10% off total food bill. DISCOUNT: 10% off all floral and gift items excluding wire outs. DISCOUNT: 10% off all items. DISCOUNT: 10% off any service. Oil filter and change for $18.79 – most vehicles. DISCOUNT: $100 off any internal repair over $500. DISCOUNT: $4 off signature service: CODE CCC4. DISCOUNT: 20% off any detail package; 25% off any detail package with purchase of 2 or more detail packages. DISCOUNT: 10% off a full set of nails. DISCOUNT: Buy 1 game, get 1 free for cosmic or open bowling, up to 4 people. Three free games per person! DISCOUNT: One free game with the purchase of 1 paid game. DISCOUNT: 10% off entire order. DISCOUNT: 10% off total order – not to be used with any other coupons or offer. DISCOUNT: 10% off any purchases from the gift shop. DISCOUNT: 15% discount off total purchase. DISCOUNT: 10% discount on all items. DISCOUNT: $1.45 off any wash; $2 off oil lube service; $10 off complete detail; only one discount per car, per day. DISCOUNT (for all listed locations):20% off any detail package; 25% off any detail package with purchase of 2 or more detail packages. DISCOUNT: $5 off haircut, perm, or highlighting; $5 off facial or massage – all offers are for first time customers with participating stylists only. DISCOUNT:A free 30 day VIP Introductory Program. $100 discount off of the regular one time academy registration fee;. 20% discount for members who decide to pay their membership in full. DISCOUNT: 10% off all tanning packages. DISCOUNT: $1 off each person’s general admission – good for up to 8 people! DISCOUNT: Bowl 2 games, get 1 free. DISCOUNT (on all locations listed): Free Chick-Fil-A sandwich with purchase of a large drink & large fry. DISCOUNT: 10% off entire purchase excluding specials. Plaza Shoppes, 110 White Horse Rd. DISCOUNT: Buy 5 Panzarottis, get 1 free, except Tuesdays. DISCOUNT: 5% off total purchase—does not apply to sale items. DISCOUNT: 20% discount on all imported pipes, lighters, and boxes of imported cigars. DISCOUNT: 10% off merchandise. The Pampered Pussycat, L.L.C. DISCOUNT: 10% off or free delivery on any purchase of $25 and over. Wire orders excluded. DISCOUNT: $10 off any regularly priced 3-month membership; $5 off any one hour massage. DISCOUNT: Discount on all vacations. DISCOUNT: 20% discount on batting cages, spaceball, rock climbing; 10% discount on party packages with minimum of 8 guests. DISCOUNT: 6% discount on total purchase. DISCOUNT (on all locations listed): 10% off total order – not to be used with any other coupons or offer. Void where prohibited by law. DISCOUNT (for all locations listed): Free Chick-fil-A sandwich with the purchase of a large fry and large drink. DISCOUNT: 15% off total purchase. DISCOUNT: 20% off total bill. DISCOUNT: 10% off wash, cut, and blow dry. DISCOUNT: Monday thru Thursday receive 15% off lunch and dinner; Friday and Saturday 10% off, and Sunday 20% off (excludes daily specials). DISCOUNT (for all listed locations): 20% off any detail package; 25% off any detail package with purchase of 2 or more detail packages. DISCOUNT (for all listed locations): 50% off enrollment fee.